We can learn something from the French here in Canada as 1 in 5 Canadian youths, aged between 12 and 17, were determined to be overweight or obese. ‘For example, French parents ask their children: “Are you still hungry?” rather than “Are you full?” — a subtle, but important distinction’. Of course the parents wouldn’t ask their children if they were full if the parents wanted to know if the children had had enough to eat. That’s because “are you full?” – “êtes vous/es tu pleine?” – is a French idiom for asking if you are pregnant. So asking if the children are hungry makes far more sense, since otherwise they just wouldn’t get what their parents were driving at. It’s not a subtle way of getting a different agenda over at all. And French idiom usually avoids the “are you …” forms for sensed personal states anyway, instead going for “do you feel …” (with the less direct “ressentir” generally preferred to the more physical “sentir”, e.g. “je me ressens tellement fatigué” for “I feel [am] so tired”), or “have you …” forms in the case of hunger and thirst etc. 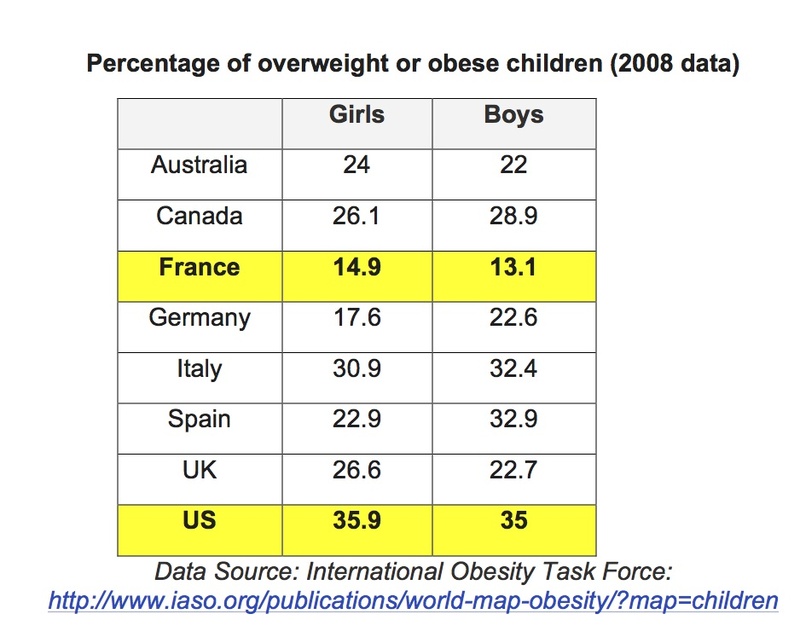 I like books like Nourishing Traditions by Sally Fallon and biochemist Mary G. Enig, PhD( alsoo author of Eat Fat Lose Fat) and its absolutely clear to me, why French children are not obese. You seem to totally overlook the fact that France is one of the only countries that would not approve legalizing the use of hormones in their animal feeds; this means the French are one of the few populations in today’s “advanced countries” who are not being exposed daily to the build up of excessive hormone levels from eating livestock whose meat is laced with hormones to “build fat fast” on chickens, beef, pork, etc. This same toxic increase in levels of hormones is building fat on the human populations in countries where hormones are permitted in animal feed to allow faster fat buildup on livestock in order to process meat faster for production & consumption. This same introduction of hormone-laced livestock feed has also contributed to a 50% reduction in sperm count in males over the past 25 years, has caused a drop in the age of onset of puberty (a fat-triggered process in humans) in girls over the past 20 years, & is causing breast buds to develop on male children entering puberty & is reducing their body hair development during puberty. These trends are also only seen in those countries who now allow hormones in livestock feed. All these hormones are increasing estrogen levels in the populations where they are permitted, are being stored at toxic levels, & are causing humans to “fatten up” just like a veal calf. We now also see increasing levels of estrogen-sensitive breast cancer in these same countries & an ever increasing level of obesity in infants under the age of 6 months in those same populations. France is to be commended for resisting all the pressure from their agricultural industries to try to force them to use hormone feeds for their livestock in order for businesses to make a faster “buck” off meat processing procedures. By artificially increasing estrogen levels, meat processors can ready livestock for market-weight in half the amount of time it USED to take to grow a chicken, pig, or cow big enough to butcher & sell. The world wide obesity epidemic is not occurring in France because France has protected its citizens from toxic hormone levels by restricting the use of hormones in meat production. My hat’s off to them & I wish people would do the research to identify the association of the introduction of hormone animal feeds & the emergence of obesity & estrogen increases in a country’s human population. Now even our babies are being impacted & becoming obese just from the damage done to their parents’ endocrine systems, sigh….so sad. Hurray for France! Keep blocking those hormone feeds & you’ll STAY slim. Loved your book and enjoy your blog. We are Americans living in Poland and now have a 13-week old daughter. The Polish pediatricians all seem to follow similar guidelines for introducing foods like the French, at 6 months, but they don’t introduce grains until 8 months- 1 year! Polish kids aren’t fat and even at restaurants there are no “kids menus”…they simply eat off their parent’s plate or eat something brought from home. One big difference I have seen is that strollers (prams) in Europe don’t have the “tray” attachment like most strollers do in the States for toddlers and preschoolers. I think that the tray encourages snacking on the go between meals. What I can add is that in France, children are introduced to a lot of kind of food since their very young age, and parents are told by the family doctor what kind of food is good to be introduced in the child’s diet and when. It allows to reduce the risk of having food allergies. I have not yet read your book but plan to do so! I have loved french culture ever since I visited France as an undergrad studying art. I remember feeling so at home there and so much was familiar to me. I later realized that my comfort with the culture came from my beloved grandmother who traveled there often and filled her home with all things french, and managed to cook three meals a day from scratch her entire life. I think this is why the snack has become paramount in our schools. The schools would rather give the kids 15 minutes for lunch, they are not allowed to talk during that time or socialize, when time is up they are all instructed to toss it in the garbage. No worries, if they are hungry later they can have their snack! Its not working, kids are getting fat, food is being wasted and test scores are still lacking. It is really interesting to hear how French people introduce a variety of foods to their children from a young age and it is something I did with my own children, even though I am from the UK. I do admit; however, to incorporating vegetables into ‘gravy’ for the meat and potatoes, but I would put some of these vegetables on the plate and encourage them to just eat one, e.g, one pea, one carrot slice, one brussel. Consequently, my grown up children now eat all vegetables. I am currently in France now and it goes without saying that hardly any French people are overweight. In fact, by UK and USA standards, many would be classed as ‘skinny’. I am also a Weston A Price member, have been involved for about five years now. Before traveling I now Google WAPF chapters to see what each is up to and ask for some food tips on eating out, where to shop, etc. I am going to Paris in June so googled WAPF for France but found only one or two chapters in all of France and not in Paris, so I’d say the French aren’t in general aren’t familiar with Weston Price’s work. Question Karen. Why do you suppose the Italian and Spanish children are getting heavier (by the chart at least)? I was not surprised of course to see the US, Canada and The UK leading the pack, but surprised by those two countries. Are they slipping away from traditional foods in favor of processed and is there a lack of exercise there also? 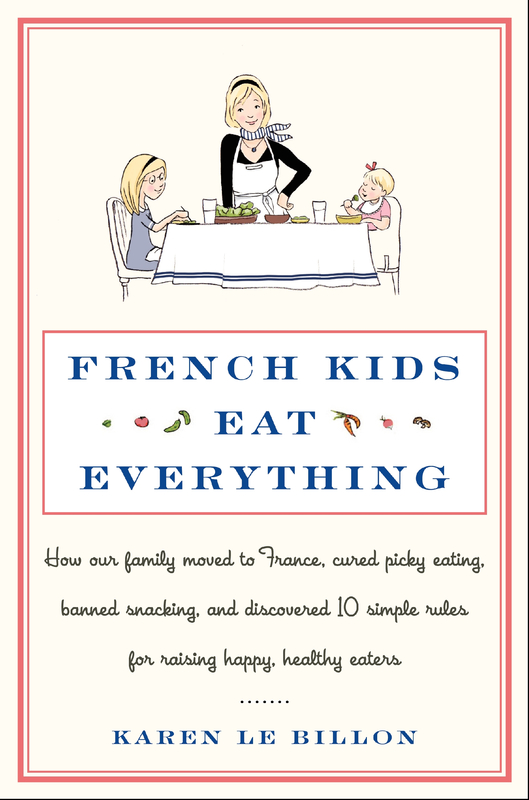 BTW, loved your book French Kids Eat Everything and though my own children are grown and gone, am applying some of the tips to my husband and myself, especially on snacking. When you eat traditional, nutrient dense foods as recommended by WAPF, you don’t feel hungry and don’t really need to snack. I always thought something was wrong with this “Eat every two hours to keep your blood sugar up,” thing that’s been going around for at least the past decade or two. Yes, you keep it up, but them crash and need more food contributing to weight gain! What a wonderful article and thanks for the comment on butter. I follow the guidelines of nutrition from the book Nourishing Traditions by Sally Fallon and find that my kids are healthier and fall sick a lot less. After some searching I found that in my Indian family, saturated fat such as cream and ghee was almost revered. My grandmother would tell me that raw milk, with the cream on top ( not low fat or fat free!) would give extraordinary health to children-I now know that it must come from healthy, grass fed cows. 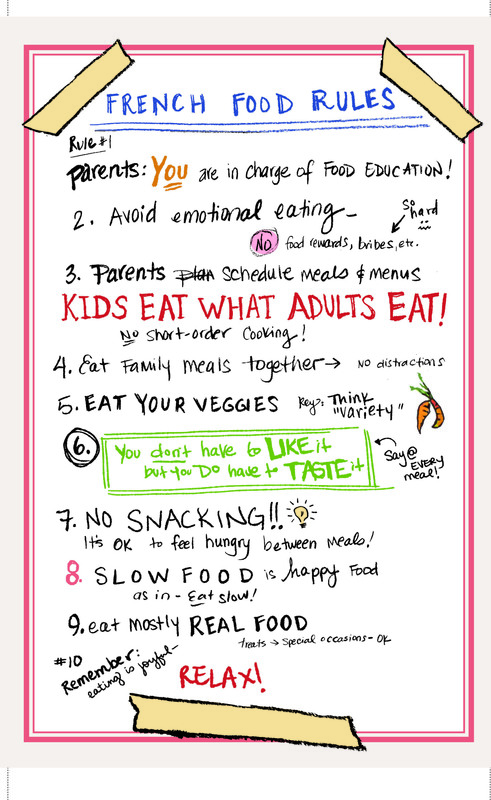 As for my children`s eating habits, I was lucky to have a firstborn who was an enthusiastic eater. He is now 10, and still is as happy to try out new things. His younger brother, who was picky, eventually followed his brother`s example, but it took years, and I wish I had read your book! there is still a lot I can get from it, but i am happy that both my kids love most vegetables, fish, organ meats such as liver, brain and kidneys. I actually get requests for more. My older son wants to try sushi which makes him better than me!! Thank you for your article. i found this very interesting and a huge help for my assignment. I am doing a nursing diploma and am currently researching childhood obesity, difference between English children and french children. my partner lived in France for 3 years i therefore no bits and pieces about their eating habits but you have helped me tremendously on my research. From 1976 to 2000, in the French American program for fifth graders traveling to France and to the USA, it was possible to follow the morphological changes between French and American 10 year old children. Charts are given in a book in English: ” French American class, It’s a long way to France. Already in 1976 the difference was obvious between the number of fat children in the American classes and the French classes participating. The book will explain why because the children were fed the American and the French ways. Beeing in the opposite siuation, French mom living in the US, I would like to share with you my opposite experience. It is very hard to eat “normally” in the US. First thing it is very expensive to find quality food. To find here the same quality at the same price as in France I have to go to Costco. It is very hard to find plain food and the already made food is cheaper than the non-cooked food, but not healthier (the opposite than in France). Even sodas are cheaper than water! In every place you go with your children you pay $5 the little bottle of water, compare to $1 the unlimited refilled soda! It’s true that in France eating is a pleasure, but cooking too! We teach our children how to cook very young simply by doing with them their favorite receipe, they love that! If they know how to cook, they know what they eat. They know how many fat there is in a cake, compare to bread. It is not a conscious knowlegde, more a culture one. You said that French don’t know better about food than american because they didn’t answer correctly about the fat in whole milk, but 85% of consumed milk in Fance is low fat milk. Even if they don’t know it consciously, it is part of the culture to avoid it. Just to give you an exemple, when I arrived in the US 3 years ago, I took some English lesson. I asked my teacher about cheese cake, what kind of cheese is it made of? She didn’t know! It was so surprising for me. If you don’t know what you eat, you can’t eat healthy! One last thing, in the French curriculum biology is a real class since 1st grade, they learn what their body are made of, how it works and what their body need to be healthy. In the US curriculum biology is just a little part of Physical Education. I think it’s the quality of food too. It is all of what you mentioned, but it’s also using nutrient dense food. So you have the French “rules” and the desire for good quality coupled with using meats that we have shunned here in the US. Have you read anything about WEston A. Price and the book Nourishing Traditions? This was a dentist who went around the world studying the diets of other people’s and their caries or lack thereof and what he found was shocking. There were certain characteristics that they all shared even though some groups were almost all meat eaters (Masai, Inuits) and some more varied. I think that it’s interesting that the almost exclusive meat eaters were fine. They would eat the organs and glands of the animals, which I believe “fed” the glands of the people. And the French do all of the “icky” parts which are very good for you. And no GMO’s, thank the Lord! Excellent article and fascinating project you are doing with the school lunches. I keep hearing kids and parents complain about our new school lunch program that has been implemented in the US this school year. They are saying that the kids are starving when they come home from school because they are “BIG” and growing. It makes me wonder if part of our culture is about making sure our kids get enough to eat and forgetting about the amount of processed foods. Have you mentioned the impact of the ban on GMO’s in France and how that plays out in terms of obesity or health related problems? I’d love to hear more about the ‘healthy food’ law that Chile is applying — and the ways in which you overcome some of that resistance! Gran artículo, coincido plenamente en la visión incorporada en educación y desde el punto de vista cultural. Saludos desde Chile donde tenemos una ley sobre alimentación saludable, pero que estamos en etapas iniciales de su aplicación, con la resistencia y codicia de la industria alimentaria. Love this story! It’s not the first time that I have heard of French children refusing to eat foods considered ‘delicious’ by American standards. Proof that what we consider to be ‘edible’ and ‘tasty’ is strongly influenced by culture. Which is a hopeful idea — because cultures can evolve and adapt–which I think is urgently necessary in North American kids’ food culture! I too raised our Franco-American children mostly in France and concur 100% with your findings. What shocked me most when we moved briefly to the USA was 1) the constant snacking by adults and children and 2) the idea of “kids’ menus” (not to mention the appalling offerings of the kids’ menus). Once in the USA, I was contacted by my child’s kindergarten teacher. Apparently my son was refusing to eat the school snack. I asked what sort of snack we were talking about and she answered, “Jello fingers”. I replied that no French child has ever seen or eaten a Jello finger and anyway, I did not want him eating school snacks as this interfered with our bfast-lunch-gouter-dinner eating schedule. She thought we were odd but respected my wishes to leave my son alone about school snacks. Great stuff! I wish Australians would stop following the USA & all the celebrity rubbish that accompanies their way of life! I don’t have kids and I’m in awe of the way Australian parents & grandparents encourage their offspring to be guilty about food from a young age, yet also encourage them to eat all the junky, obesogenic things as “treats”. The French kids comply with the “norm” they know- try everything and eat while you’re hungry & it would be great if they did the exercise thing as well (dream on…). I’m pretty much alone in not knowing the caloric value of anything I eat and never knowing my exact weight, but I don’t FEEL like dessert after a decent meal out containing a bit of meat or fish, but my significantly obese friends all giggle & hoe into huge slices of lemon pie and chocolate cake. Afterwards they invariably say- “I’ll have to starve myself tomorrow” and never do. So many adults won’t eat spinach or broccoli or Brussels sprouts, but I regularly serve them up & eat them- hiding them in delicious soups for my partner sometimes! I also don’t know WHY people buy “treat” foodstuffs & keep them in the pantry and then complain that their kids eat it all then won’t eat their dinner! Parents seem to have handed over control of the household to kids amidst fears of alienating them. Kids then grow up and blame their parents (quite rightly IMHO) for making them fat! It’s all mad- and I’m not smug about my own situation, but despair of what’s going to happen in a decade or two. OH, and one of our favorite “fast food” meals was an English cucumber, eaten from one end down like a corn dog or an ice cream cone. Another lovely hot summer day snack! My sweet girl is now 19 years old, slim, healthy and beautiful – she bakes her own whole wheat bread, eats veggies first at every meal, and enjoys the occasional treat when she’s in the mood – and she bakes them herself rather than buying junk in a box at the story. -less is more, a demitasse of espresso vs. our venti, it’s the experience rather than the quantity. -walking culture rather than driving, I saw so many people stroll to their destination and those who drove or used mass transit took advantage of walking every chance they had. -Children ate what their parents ate – no mac and cheese/bland/beige food but vibrant, flavorful options from very early on create a more sophisticated palate and create a more balanced variety. -Quality ingredients – better to have a slice of Clafouti (fresh, made of known and natural products) rather than mass produced items with impossible to pronounce chemical names as the first few ingredients. I’ll take a fresh bakery item any day of the week over a sugary snack I find in the store. I think part of the problem with obesity is that the sugary foods are the least expensive for people to buy . For example, it is far cheaper for me to buy a thing of margarine than to buy some butter at the grocery store. What a fascinating comment. Much research has been done on ‘high satiety’ foods that give people a ‘satisfied’ feeling. It turns out that having a bit of fat with your meal increases the overall satiety rating, and so you will indeed full more full, for longer, if you eat fat with your meal. I’ve really noticed this effect in France. I simply don’t feel hungry in between meals. Having a small piece of cheese after the main meal achieves this effect — so it doesn’t need to be a large amount of food. Ditto with butter. Thanks so much! Glad you enjoyed it. I’d love to hear about the reaction in your class (or on FB). I hadn’t been planning on doing the lunches again this year but your email makes me think that I should! Regarding allergies: with a medically certified allergy, children can either bring their own lunch or (usually in bigger towns that have ‘cuisines centrales’) a separate lunch is made for them. Both are stored separately. Allergy rates were lower in France in the past (anecdotally) but are now growing, as is awareness — inspiring much debate as to the causes. I think the government “war on obesity” is going the wrong direction in declaring that low fat is best. Especially in snack/junk food the fat is replaced with sugar. Fifty to sixty years ago when we did not have a problem with obesity, people ate butter not fake margarine, restaurant french fries were fried in beef tallow, and now it’s replaced with vegetable oil. (I am prejudiced against vegetable oils also. Their usage is more recent and I think they are unnatural.) I do not think saturated fats are evil. How long have people been eating bacon, butter, etc. compared to canola and other vegetable oils? Karen, this is a fabulous post. I’ve read your book and all your posts but this one is well stated, articulates the major points and the focus is centered on the core beliefs. I am going to use this article as a basis for discussion in my French conversation class and post it on Facebook. Are you planning on doing the lunches again this year? One question I still have: how does the French school lunch program handle kids with allergies? Many children have severe food allergies, even life threatening and it can’t be that France is exempt from this crisis. Love to hear about this too.